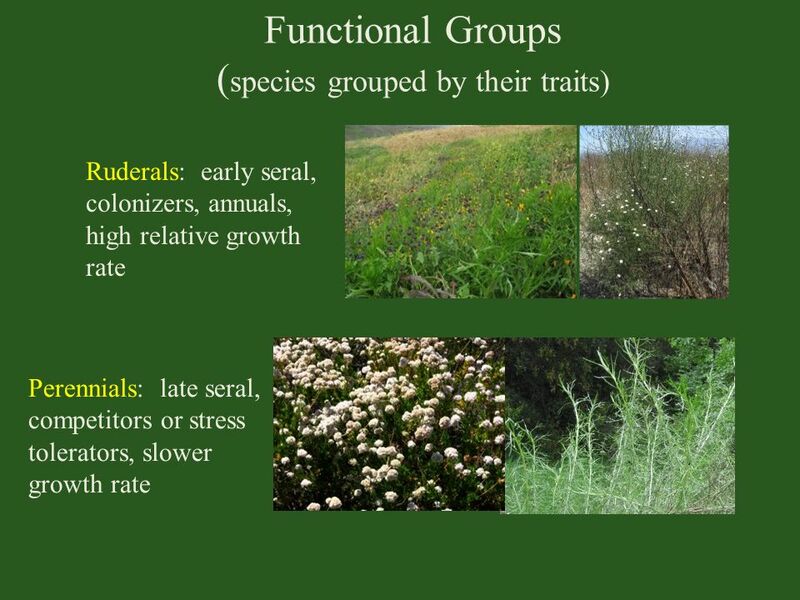 Ruderals: early seral, colonizers, annuals, high relative growth rate Perennials: late seral, competitors or stress tolerators, slower growth rate We’re particularly interested in the performance of different functional groups of native plants used in restoration. Select plants based on traits (Pywell et al. 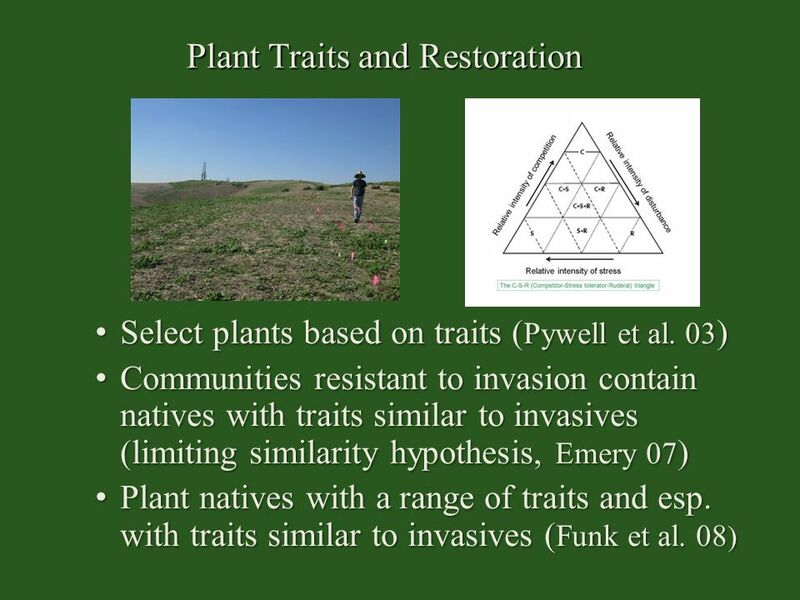 03) Communities resistant to invasion contain natives with traits similar to invasives (limiting similarity hypothesis, Emery 07) Plant natives with a range of traits and esp. with traits similar to invasives (Funk et al. 08) In restoration, plant traits are important to consider in deciding what species to use in projects. For example, one might think about where a plant falls on Grime’s triangle, does it have traits that allow it to be a good colonizer, a stress-tolerator, or a good competitor. 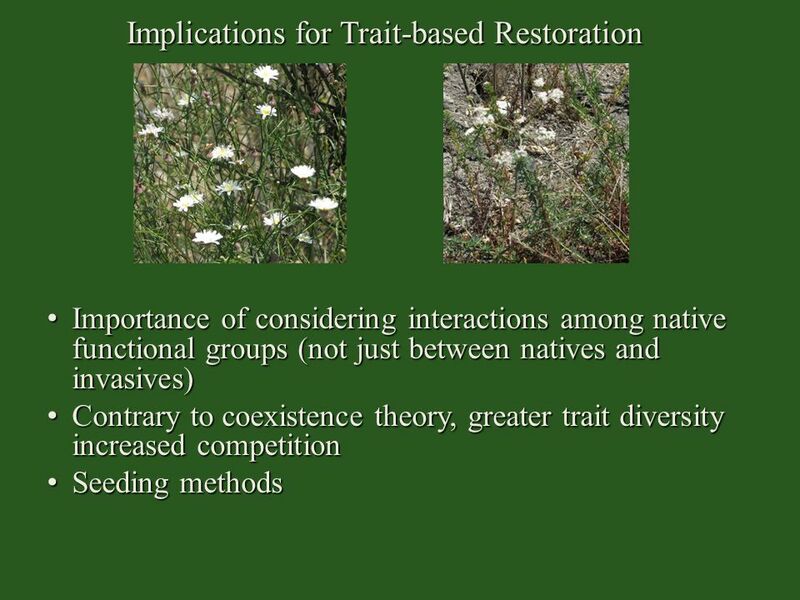 In trait-based restoration, plants are selected based on whether they have traits that enable them to establish and persist in the community. Intact communities are thought to be more resistant to invasion by non-native, invasive species when they contain natives with traits similar to invasives, this has been tested in restoration projects where communities are assembled that have different trait combinations. 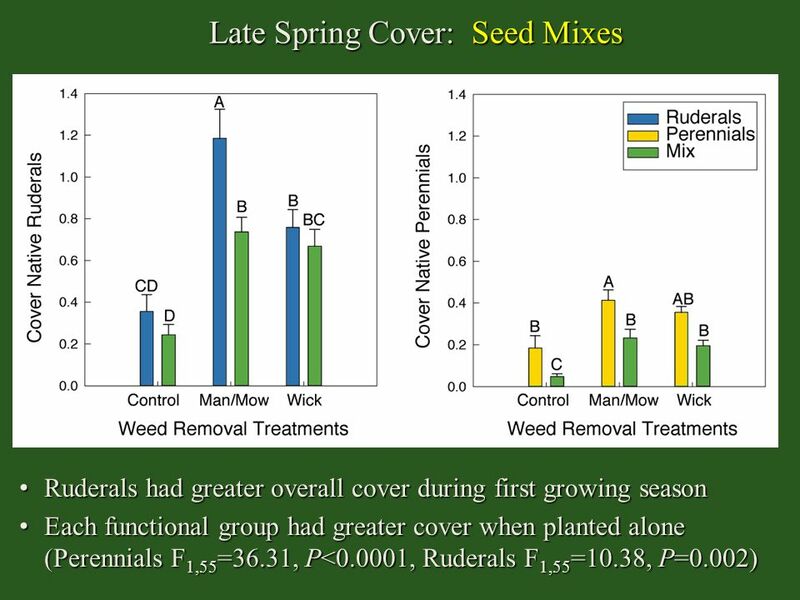 4 Research Questions What native functional group (ruderals, perennials, or a mix) results in the best native establishment? Mechanics of restoration (Seeding Method? Weed removal methods?) 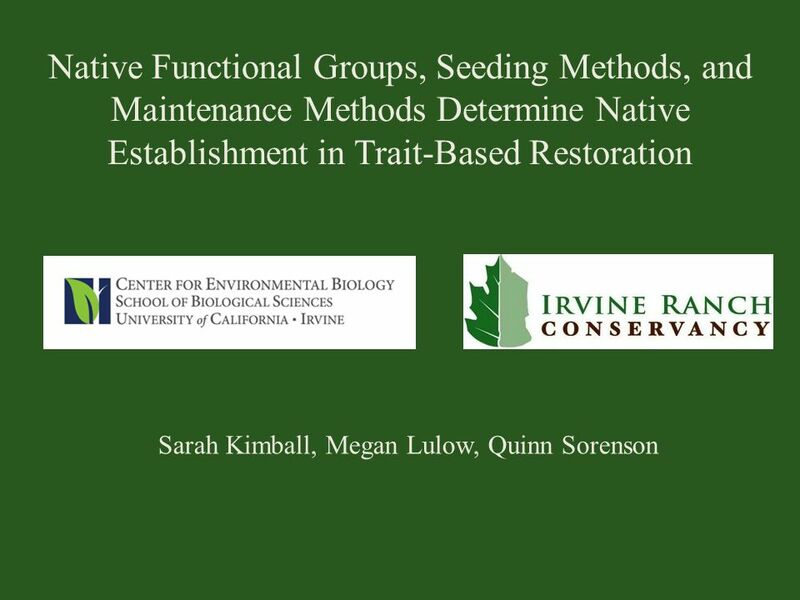 Although people are investigating how different functional groups used in restoration may interact with invasive species, we’re not aware of many studies focusing on how the different native functional groups may interact with one another during establishment of the native community. 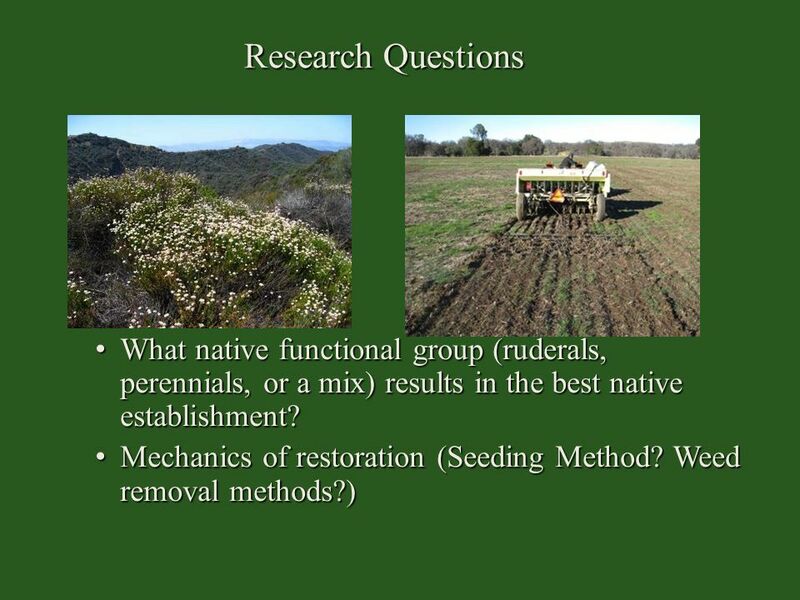 There are also on-going questions in restoration about the best method of seeding and of reducing the cover of non-natives. These may differ depending on the native functional group and may be complicated by mixing groups. Mow June 2010 Spray Nov 2010 Seed Dec 2010 West Loma Ridge on the Irvine Ranch, area that was grazed and burned in the past and had a high cover of non-native species. 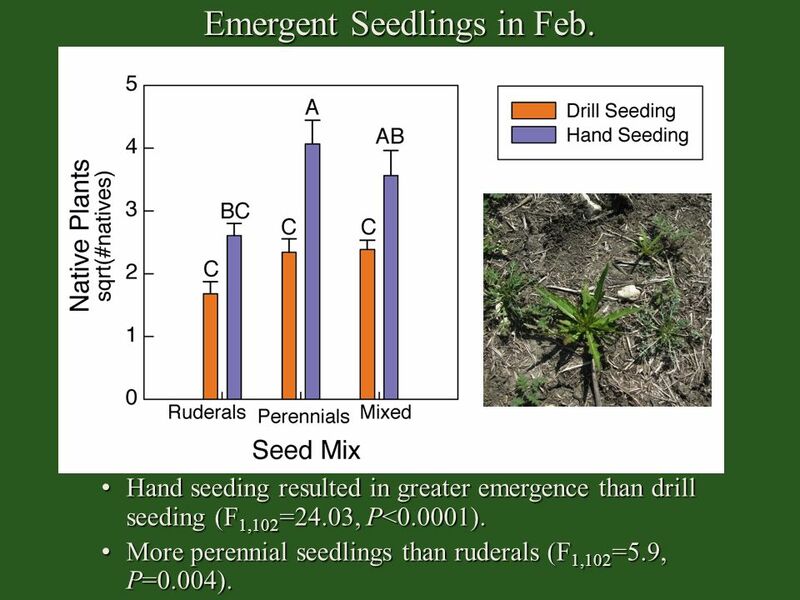 11 Emergent Seedlings in Feb.
Hand seeding resulted in greater emergence than drill seeding (F1,102=24.03, P<0.0001). More perennial seedlings than ruderals (F1,102=5.9, P=0.004). 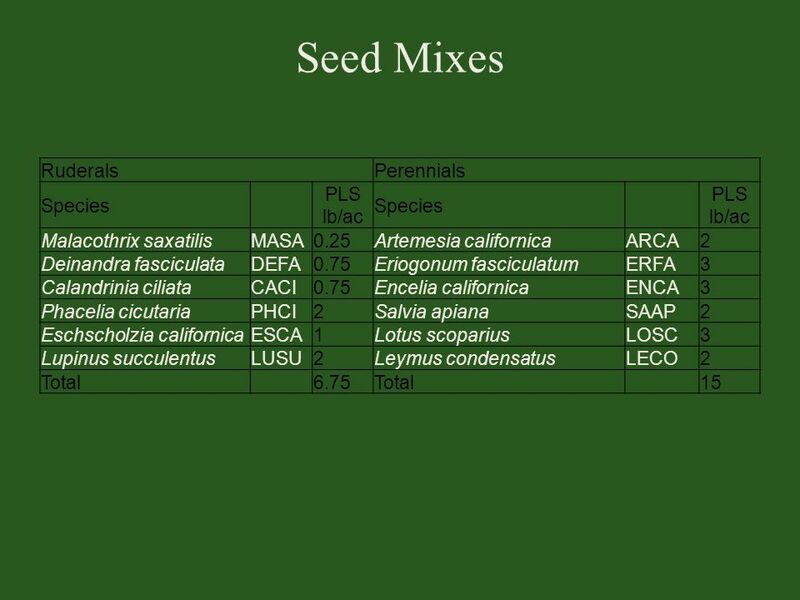 Consider changing axis of native ruderals to point out higher germination of perennials. 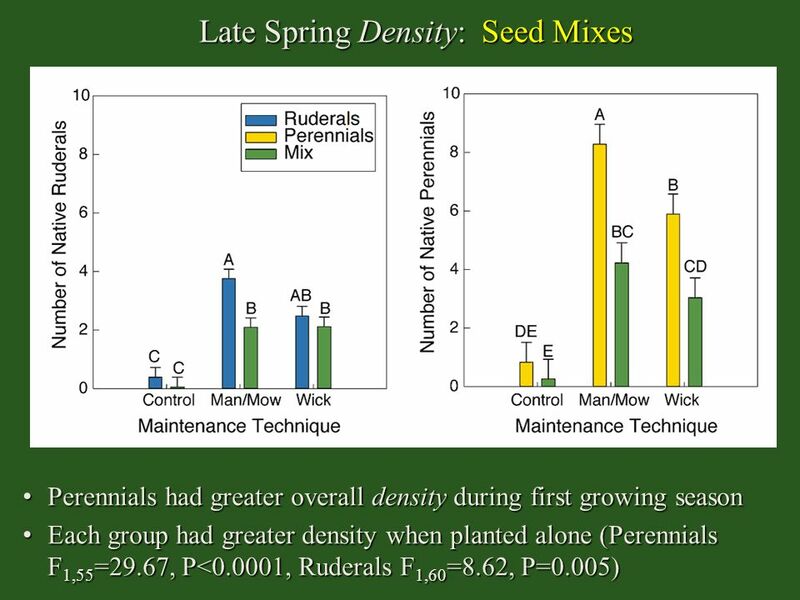 • More perennials when seeded alone than in mixed group (F1,63=5.87, P=0.0183). 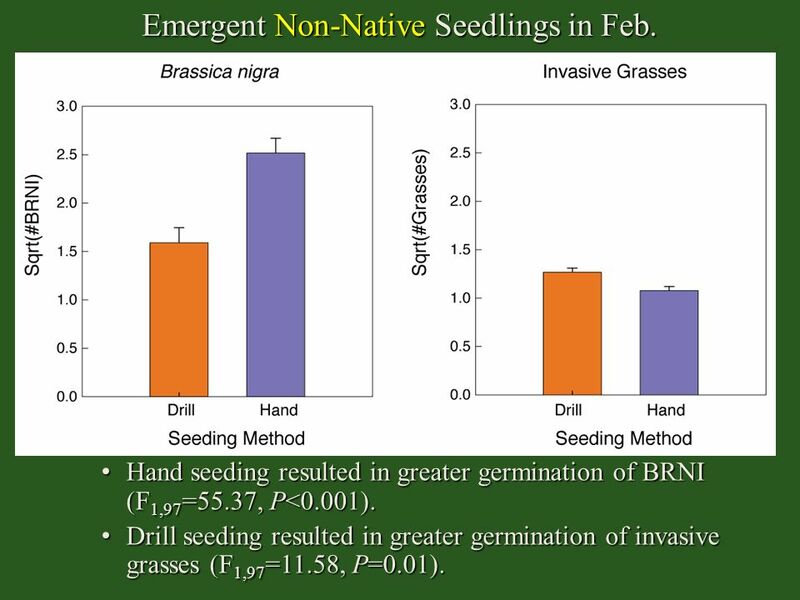 13 Emergent Non-Native Seedlings in Feb.
Hand seeding resulted in greater germination of BRNI (F1,97=55.37, P<0.001). 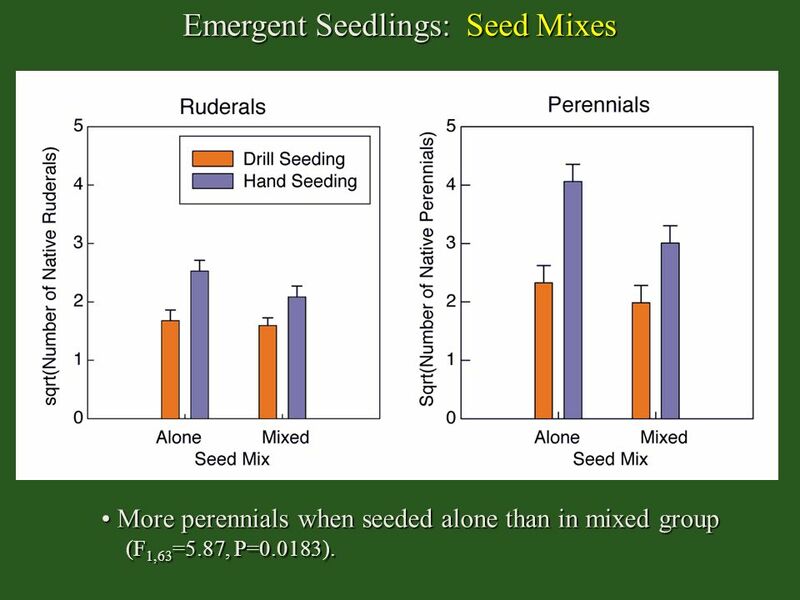 Drill seeding resulted in greater germination of invasive grasses (F1,97=11.58, P=0.01). 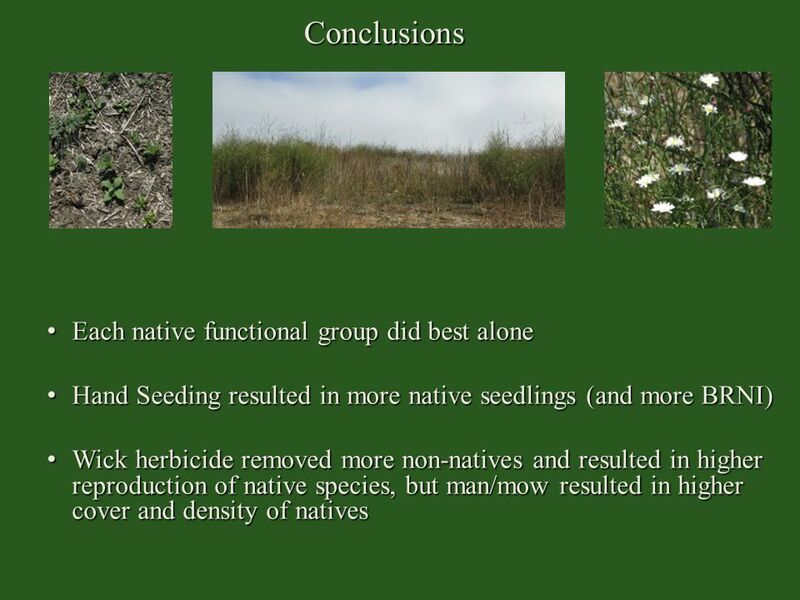 Wick was most effective at reducing non-natives. 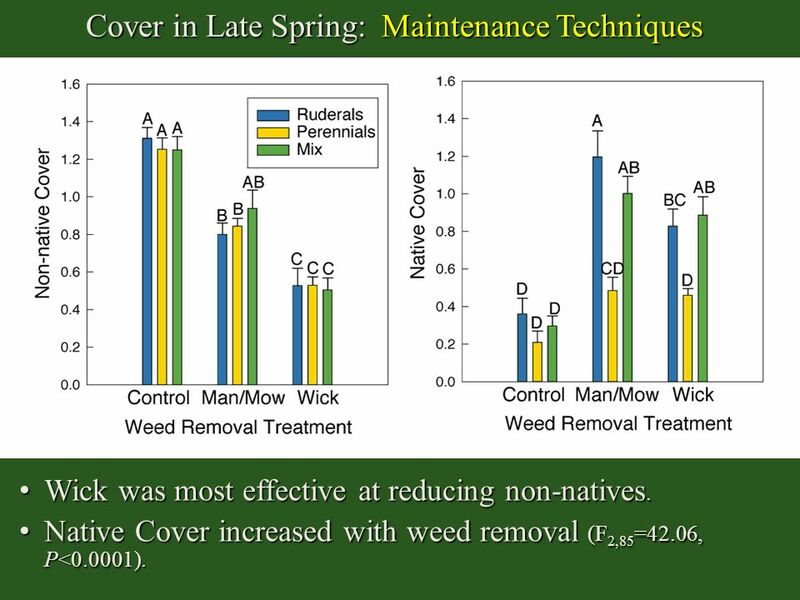 Native Cover increased with weed removal (F2,85=42.06, P<0.0001). Also mention that annuals had higher reproduction in the wich treatment plots. 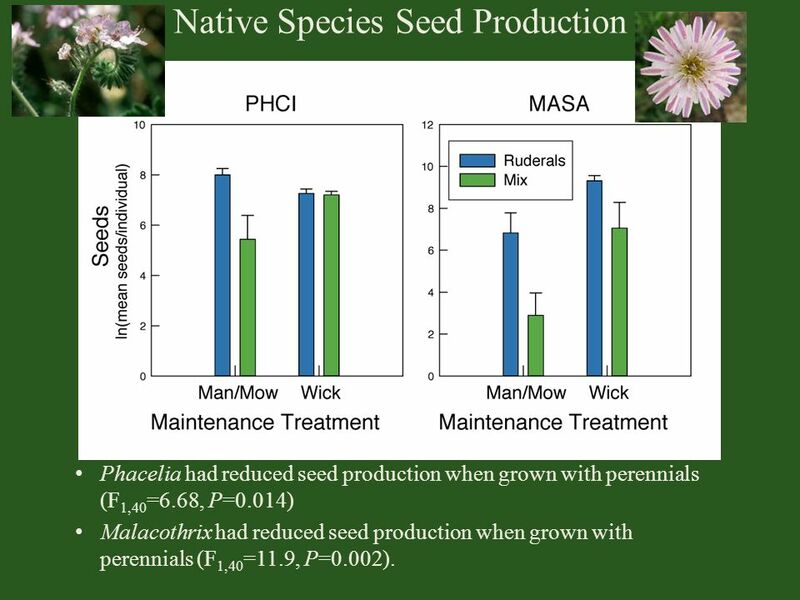 Phacelia had reduced seed production when grown with perennials (F1,40=6.68, P=0.014) Malacothrix had reduced seed production when grown with perennials (F1,40=11.9, P=0.002). Eriogonum only reproduced in the wick treatment plots without ruderals. 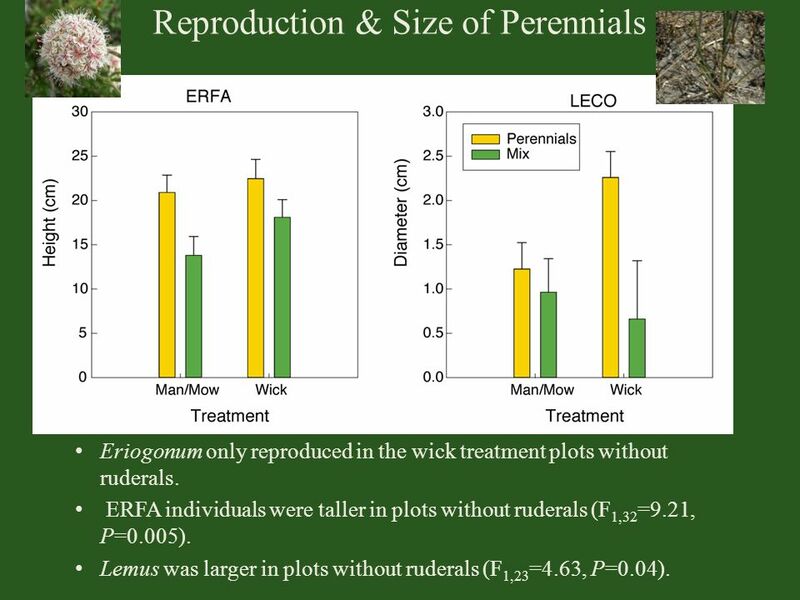 ERFA individuals were taller in plots without ruderals (F1,32=9.21, P=0.005). 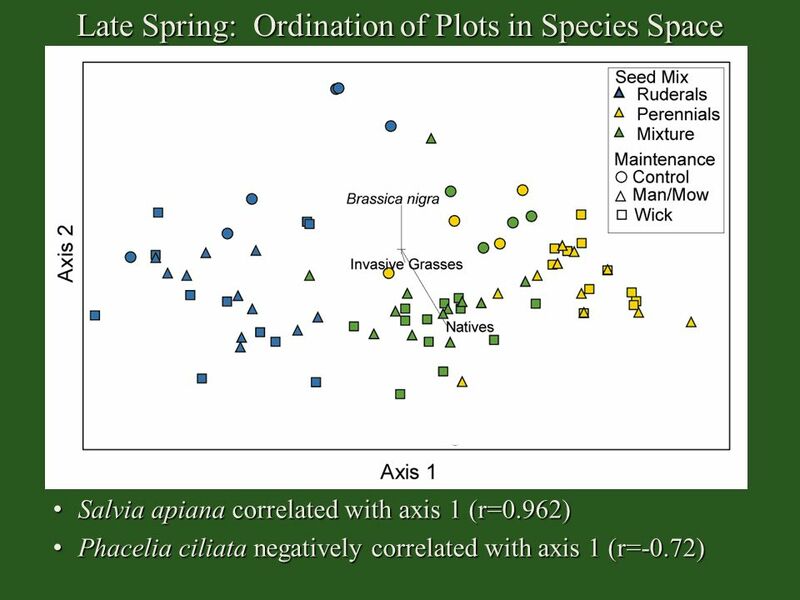 Lemus was larger in plots without ruderals (F1,23=4.63, P=0.04). 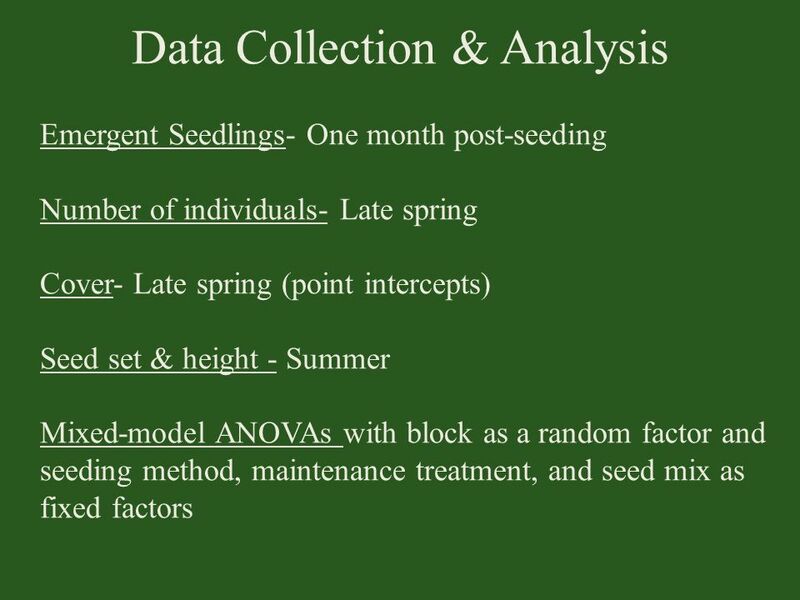 22 Next Steps Collecting data this year on germination in plots. 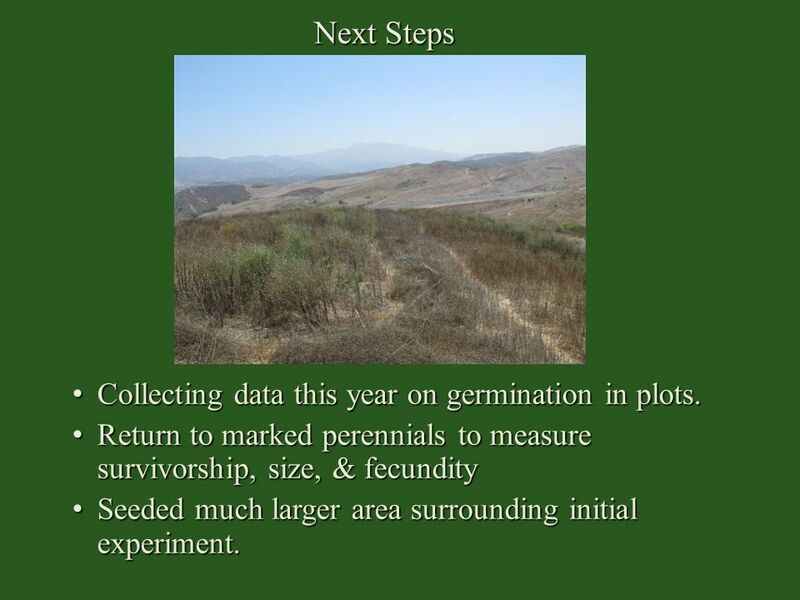 Return to marked perennials to measure survivorship, size, & fecundity Seeded much larger area surrounding initial experiment. Download ppt "Sarah Kimball, Megan Lulow, Quinn Sorenson"
Expanded Opportunities with Seeded Warm Season Turf. 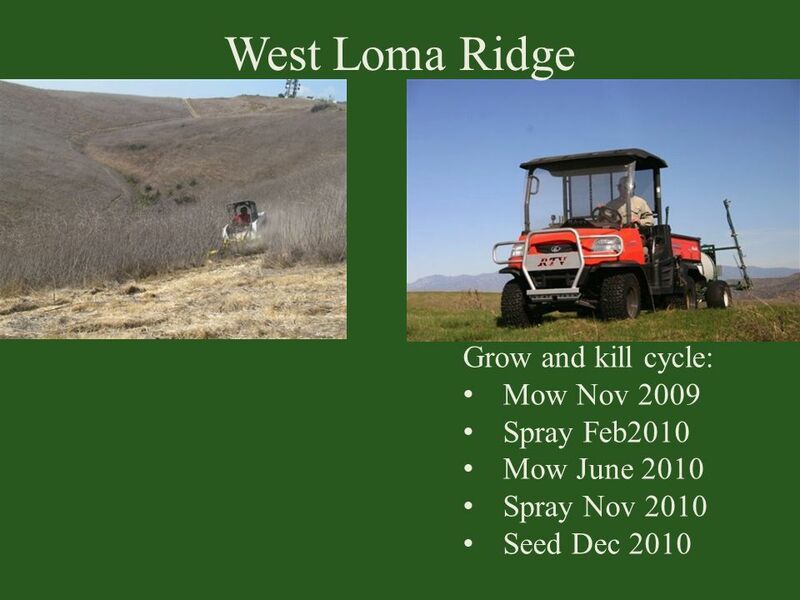 WEED MANAGEMENT FORESTED WETLANDS. Weed Problems Early successional – let nature take its course Florida Institute of Phosphate Research Invasive, persistent. 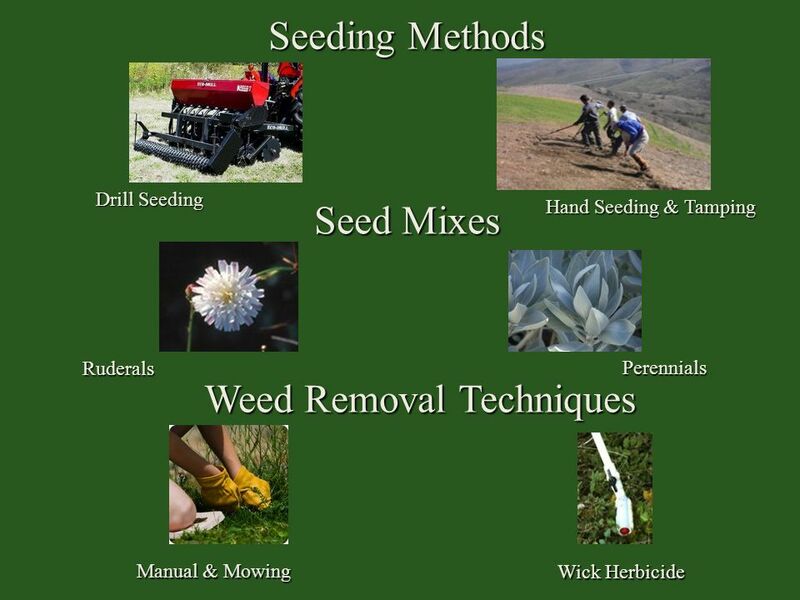 Know Your Weeds How to Control Undesirable Plants (i.e. Weeds) OLLI May 2, 2013. Kevin B. Kelley and Lloyd C. Haderlie AgraServ, Inc., American Falls, ID. Soil Preparation Expectations Maintenance Examples. Beneficial Management Practices for Saskatchewan Species at Risk: Western Spiderwort Threatened. Managing Weeds This presentation is about the management of weeds. Fire and Wildlife Habitat Restoration Johanna Freeman, PhD student Johanna Freeman UF School of Forest Resources and Conservation. 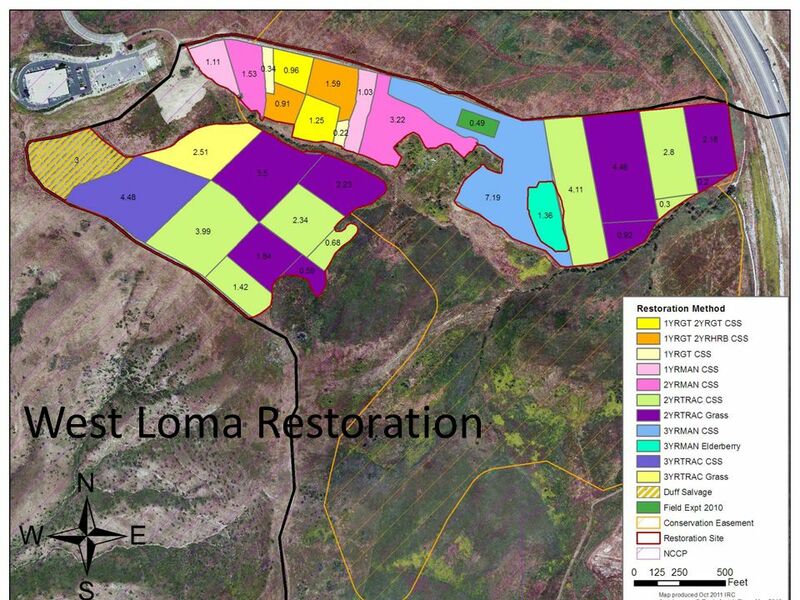 Preparing Cutover Woodland for Longleaf Establishment By Larry J. Such NC Division of Forest Resources. Types and Categories of Range Plants. Objectives 1. Categorize plants according to: growth form, life span, season of growth, origin, and forage value. Matching PLATEAU and JOURNEY with Your Annual Brome Control Program Jim Crosby. 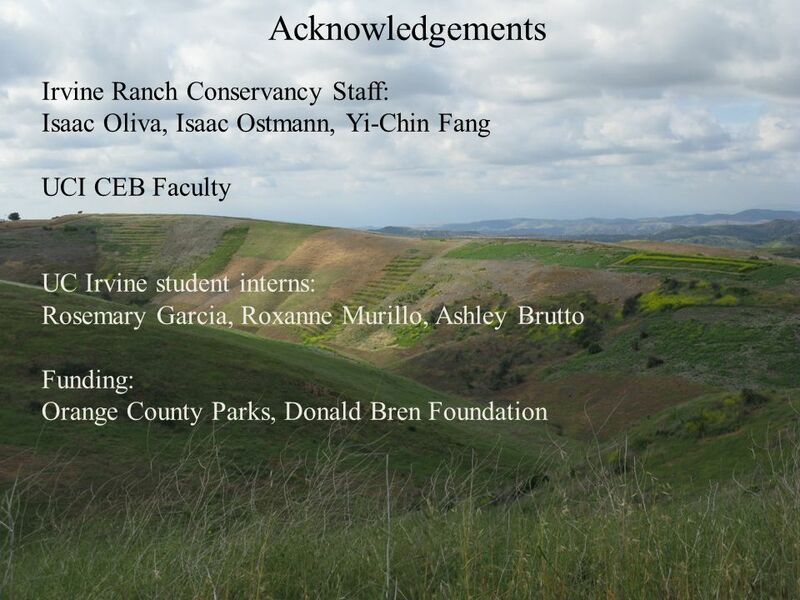 10/12/071 Managing succession in rangelands Optional Reading: Westoby et al., 1989, Opportunistic Management for Rangelands not at Equilibrium, J Range. 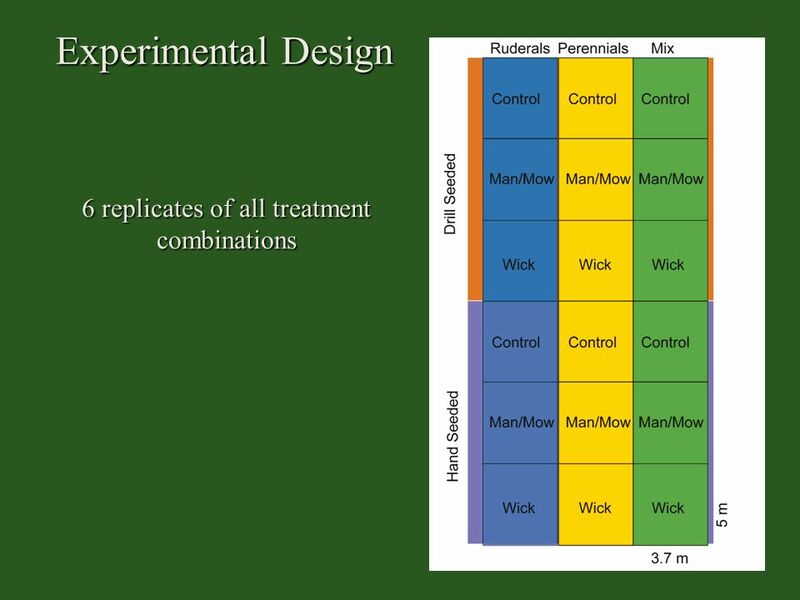 Management of cheatgrass fuel loading in the shrub-steppe Steven O. Link, PhD (Botany) Native Plant Landscaping and Restoration LLC 4604 E. Robin Ct. West. 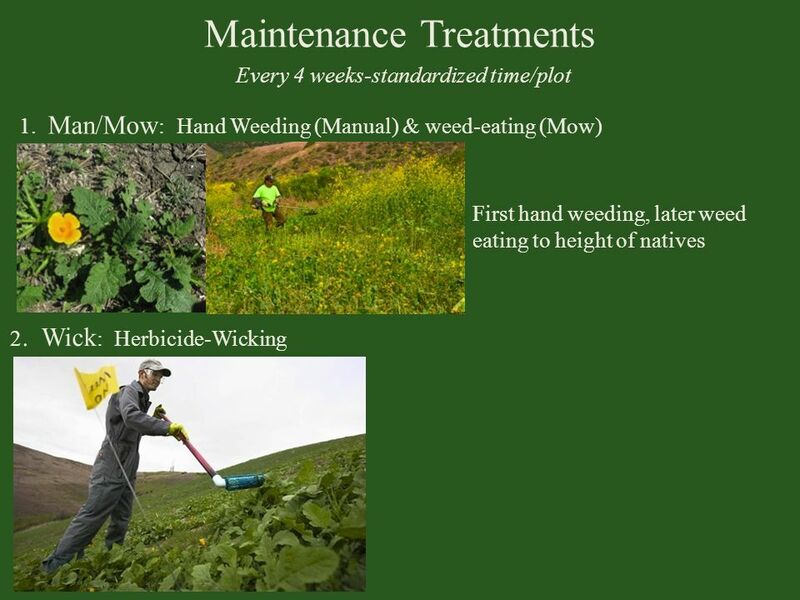 MOWING PRACTICES Where, When, Why, and How Grass Type Perennial – vegetative reproduction through rhizomes, stolons, and tillering Annual – weedy grasses. INTRODUCTION Figure 1: Seedling germination success by planting technique plus rainfall amount and date at the Poolesville location during fall BC. GRASSY RECONSTRUCTION: A Plant Competition Trial and insights into the relative competitiveness of two Cumberland Plain grass species.